This is a three storey is famous for its entrance which is surrounded by balcony. 300 years back Bajirao Peshwas ( II ) built this place. The carved woodwork of the balcony which surrounds the entrance of this building is the example of the fine work of ancient Peshwa Art. The wood used is pure processed Saag. It is 78 feet wide and 66 meters long. 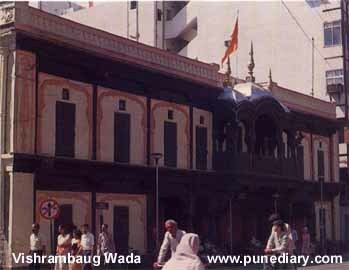 After Peshwas this place was used as a jail. Pune Municipal Corporation is soon changing this place as museum. It is a 3 floor building in the heart of the city on Bajirao road, next to Laxmi road the huge market for clothing. About 1 lacks of Rupees were spent to built this building at that time. The entire construction is of bricks.